I think I've mentioned before but through my mother's side of the family, I have northern (as in, present day North Korean) blood running through me. My maternal grandfather was from the Pyongyang region while my maternal grandmother's family's roots are from the Kaeseong region, which was not only an extremely significant political city in Korean history (having been the capital of the Goryeo Kingdom for over 500 years) but also well known for their highly-developed cuisine In fact, Kaeseong's cuisine was long considered among Korea's best regional cuisine along with Seoul and the Jeolla region. Known for their simplicity but emphasis on bringing out the best in the flavor and texture of seasonal ingredients, some of my favorite Korean dishes to this day are among those that North Korean cuisine is well known for such as mandu, bindaeddeok, and naengmyeon. Naengmyeon is mostly known today as the sweet and slightly tart cold noodle dish that's often served in barbecue houses as a meal finisher. These are, of course, pretty tasty on their own but achieved mostly through MSG packets. But making true, Pyongyang style naengmyeon is a tedious and laborious process. The flavors are not as strong as the msg-based instant naengmyeons but no less tasty as their intricate broths come together to form an intriguingly delicious vessel for the trademark chewy noodles of Pyongyang Naengmyeon. There are a handful of Pyongyang Naengmyeon restaurants around Seoul whose roots trace back to the displaced North Koreans who came and settled during the Korean War. Though all serve Pyongyang Naengmyeon, the taste all slightly differs as each place's process and ingredients differs slightly. I've written about one of my favorite Pyongyang Naengmyeon places before, Nampo Myeonok, and here's a continuation of the Pyongyang Naengmyeon series. If Pyongyang Naengmyeon lovers find the noodles at Pildong Myeonok similar to that of Eulji Myeonok and Pyongyang Myeonok in Euijeongbu, it's because all three of each respective restaurant's owners are related. During the Korean War, a Kim Kyung Pil grandmother from Pyongyang, fled south and settled in the Euijeongbu area. In 1969 she opened her Pyeongyang Naengmyeon shop. Her two daughters learned all her secrets and both sisters came to Seoul to set up shop which includes Eulji Myeonok and Pildong Myeonok. These three naengmyeon style have come to be known as the "Euijeongbu faction" of Pyongyang Naengmyeon with their trademark sprinkling of chopped scallions and red chili flakes on top. This two-story building in Pildong, Junggu near Chungmuro may require a bit of navigating for first timers even though it's on a main street but one telltale sign may be the lines that aren't uncommon for here- especially in summer. The mostly wooden structure has seating on both floors. You'll notice that the average customer is considerably older as Pyeongyang Naengmyeon isn't exactly a favorite of the youngsters who prefer the stronger naengmyeon varieties. Naengmyeon (both mul and bibim) are 10K but interestingly extra noodles for the mul naengmyeon is 7K while the noodles for bibim are 8K. You can also get the noodles warm which is also 10K a bowl. The other items on their menu are their plate of dumplings (10K), sooyook- boiled beef- (25K for 200g), and jeyook- boiled pork- (18K for 200g). I haven't had their dumplings or sooyook but both are popular to get with noodles and soju (especially for the ajoshi crowds). Signs saying they use less sodium, and that their beef (hanwoo), pork, and kimchi are all sourced from Korea. Only hanwoo (Korean beef) used in this establishment, says the sign. Brought out before the meal is myeonsoo, the boiled water for the noodles which, with the noodle's buckwheat base, is said to help your stomach begin digesting. Standard condiments such as vinegar and mustard on the table for naengmyeon. Visually, the trifecta of "Eulji family" naengmyeons are known for being distinctive. The mul naengmyeon's noodles are quite pale, almost looking like the flour-based somyeon for other noodles dishes, and also comes with a sprinkling of red chili powder and chopped scallions. The chili powder on top is, especially, quite unique. Their addition is said to be because it is said not only to pique your taste buds but the chili powder's "hot" properties is said to counterbalance the buckwheat's "cold" properties. Yes, in east Asian food, many food ingredients have a yin and yang to them. The noodles are, as I mentioned, distinctively paler. This is because they remove the shell of the buckwheat before making into noodles giving it a milder taste and look. The all important broth here actually reflects the many attributes of the noodles. Take a sip of the broth without mixing or adding in anything and you'll note that it's very clean and mild. In fact, if you don't contemplate the broth's layers, some would even find it one dimensional. It's how you understand why they add that dash of chili powder before serving. A little "point" to help give your tastebuds a little kick now and then lest your brain begins to lump all the taste and flavors into one. It's a talent really that they can get their broth, which is a mixture of both pork and beef, to be so mild and married together so perfectly. Among mul naengmyeon it's among the purest in essence which will clearly polarize tasters as being either an extraordinary display of masterful work or, simply, boring. Amazingly, the mul naengmyeon is greatly more interesting in flavor and taste than the bibim naengmyeon which is not an easy task to do. The merits of bibim naengmyeon is in its tantalizing sauce and how it brings the dish's many ingredients together. Despite the red spicy seasoning, the bibim naengmyeon is quite plain. Plain to the point you almost wonder if you need to ask for more seasoning. I'd like to think they wanted to emphasize their handmade noodles more which is why the dish is deliberately milder in seasoning. I'm not a fan of bibim naengmyeon to begin with but my friend, who is a major bibim naengmyeon fan, found the variety served here bland and boring. While I don't go as far as to say it's quite to that level, I certainly wouldn't find myself ordering it here. Can a master artisan's work be known for its remarkable simplicity? I say yes, yes it can and an example of this is Pildongmyeonok. Everything from the noodles to the broth is a remarkable display of purity in essence which, however, may not be for everyone. The degree of separation in personal taste is what will divide those who look at a master celadon piece, unadorned and unpainted, as a work of art and those who would rather go for the earthenware that has been painted and patterned. If you're a fan of of Pyongyang naengmyeon in general like me, you will find Pildongmyeonok's remarkable. But if you're a first timer to the dish, Pildongmyeongok is not where I'd recommend you to go but rather, as a baby step, somewhere like Nampomyeonok or Wooraeok. 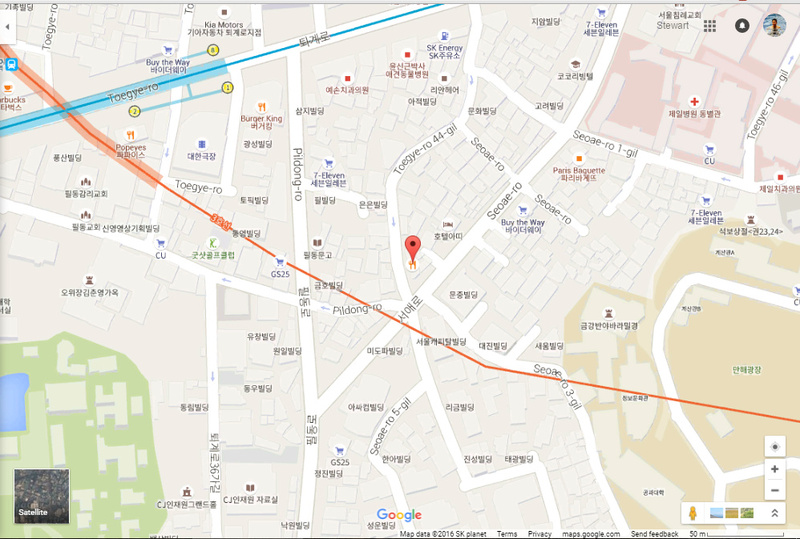 Come out of exit 1 of Chungmuro station and walk about 40m until Pildong-ro. Turn right and walk down for about 100m and turn left on another Pildong-ro. Walk about 50m and you'll get to a sort of six-way intersection. Turn left up Seoae-ro (NOT Toegyo-ro 44-gil) and you'll see Pildongmyeonok on your left. Closed on the second and fourth Sunday of every month.